Getafe are likely to be without Pablo Sarabia for Sunday’s visit of Real Madrid, after the attacker picked up a knee injury in training. Fellow winger Pedro Leon is ineligible to play against his parent club, so Abdel Barrada is likely to be handed his first start of the season. Real Madrid are checking on the fitness of centre-back Pepe, who has returned to training after suffering a concussion in the 1-1 draw against Valencia. Coach Jose Mourinho is expected to ring the changes after Thursday’s defeat to Barcelona in the Spanish Supercopa first leg. Lassana Diarra, Marcelo and Angel Di Maria could all start as the visitors look to secure their first Liga victory of the season. Los Azulones have lost their last seven encounters with the Bernabeu outfit. Getafe’s last win over their city rivals was a 3-1 home victory in November 2008. Real Madrid are unbeaten in the league away from home in 2012, winning nine of their 10 fixtures. The champions have scored 22 goals in their last eight Liga matches. By scoring against Barcelona on Thursday, Cristiano Ronaldo (pictured right) became the first Madrid player to score on four consecutive visits to Camp Nou. 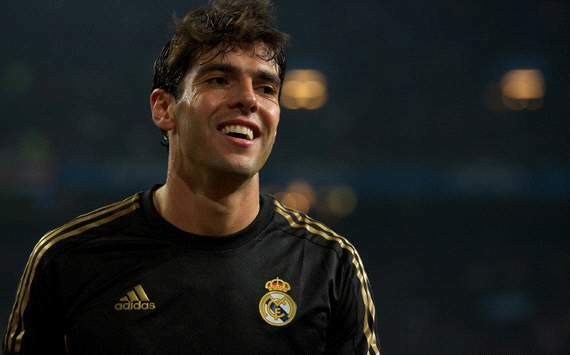 AC Milan remain favourites to sign Kaka this summer after making a renewed push to re-sign the superstar playmaker from Real Madrid, but only after the Brazilian was offered to the likes of Manchester United, Chelsea and Tottenham, Goal.com has learned. Talk in Italy is growing that Milan are ready to strike a deal to bring Kaka back to the San Siro, with a number of meetings having taken place between officials from both clubs. But sources have told The Sweeper that a loan switch to Spurs or Chelsea has been mooted as recently as this week as the Spanish giants look to offload the attacking midfielder and bring in Luka Modric, while Manchester United were also sounded out as a potential destination. Real Madrid, however, are reluctant to let the 30-year-old leave without recouping a big fee and would prefer a permanent transfer for the player, who cost £56 million when he arrived from Milan three years ago. Chelsea owner Roman Abramovich has always been a huge admirer of Kaka but the Blues are now embarking on a project to build a younger squad based around the likes of Eden Hazard and Oscar, while United also gave the proposal short shrift. Spurs would be interested in the playmaker, but could not get near matching the current £7.9m salary he earns at the Bernabeu unless Real agreed to subsidise part of his wages – something, at this stage, the Spaniards are unwilling to do. It is clear, though, that Real Madrid are ready to do business should they receive an offer in the region of £20m for a player that has now been offered to many of the top clubs in Europe. West Ham completed the signing of Matt Jarvis from Wolves on Friday after their restructured £10.75m bid was accepted by the Midlands club. But The Sweeper has learned that Fulham attempted to hijack West Ham’s swoop for the England international in midweek and, indeed, at one point were confident they would get their man. The west Londoners matched the West Ham offer of £6.5m up front that was on the table and were prepared to pay the 26-year-old £40,000-a-week to take him to Craven Cottage. The Hammers responded by increasing their initial instalment to £7.5m, which was £2m more than they were initially willing to pay when Sam Allardyce targeted the winger. This was accepted by Wolves, who have been keen to ‘sell’ the transfer as a £10m-plus switch. However, The Sweeper has been told that some of the add-ons that make up the deal are quite ‘distant’. Any visitors to West Ham’s training ground over the last few years will know that the cramped Chadwell Heath venue is not in keeping with the club’s ambition to be an established Premier League club. One of the first priorities mapped out by co-owners David Gold and David Sullivan when they bought the club in 2010 was to improve the training facilities, preferably at a new centre. Long-term, the Hammers still hope to build a state-of-the-art complex on the 29-acre site they own in Rush Green, Romford, two miles from their current training ground. But West Ham officials have also been running the rule over other potential sites, including Tottenham’s training ground in Chigwell, which they will vacate next month to move to a £40m complex in Enfield. The Spurs Lodge site would certainly be an upgrade on the portacabins of Chadwell Heath as the east London club look to improve their facilities for both the first-team and the Academy. In one of the least expected transfer sagas of the transfer window, Liverpool look to have beaten Arsenal to the season-long loan signing of Real Madrid’s Nuri Sahin. With a hefty fee apparently heading to the Bernabeu in return, Liverpool fans will be keen to know what they’re getting for their money. Sahin joined Madrid last summer for a bargain £8.7 million on the back of inspiring Borussia Dortmund to a surprise Bundesliga title, winning the German top flight’s player of the season award in the process. Despite being at the then tender age of 22, many expected the Turk to be an eventual replacement for Xabi Alonso at the Bernabeu. However, Sahin’s career at Madrid is yet to really kick-off. A knee injury picked up in August meant that by the time the midfielder returned to full fitness in November, Xabi Alonso and Sami Khedira had continued where they had left off the season before – showcasing one of the most efficient midfield partnerships in Europe. There were flashes of class from the former Dortmund man – his well-executed headed goal against Ponferradina in the Copa del Rey, along with his impressive displays in the middle of the park in both legs of Madrid’s Champions League quarter-final against APOEL Nicosia. All in all it was a campaign to forget for Sahin, with the playmaker taking part in only four Liga games last term. With that in mind some supporters of the Anfield club may feel they’re getting an unwanted cast-off, someone who failed to make it at one of Europe’s elite sides. They would be wrong. Last season was a write-off for Sahin; not because he performed poorly, he simply wasn’t given the chance to shine. During his final season with Dortmund the German-born midfielder established himself as the finest of his kind. Grabbing eight goals and 13 assists, the Turkey international was integral to BVB’s highly-lauded attacking style, often controlling the tempo of games from a deep playmaking role. As for the big games, Sahin has a proven track record of stepping up to the mantle and thriving under the pressure and intensity. In 2010-11, Dortmund pulled off a league double over nearest rivals Bayern Munich, winning 2-0 at home and 3-1 away. In both games Sahin scored. Both games Sahin outplayed his opposite number, Bastian Schweinsteiger. Both games Sahin claimed the man of the match award. Liverpool fans of course, will be hoping for the Sahin of 2010-11 to add some much needed quality to the centre of their midfield. With the Merseyside club having another hellish campaign last term, pressure is on new boss Brendan Rodgers to turn it around and the arrival of the 23-year-old is certainly a statement of intent. After flirting with the prospect of winning the Premier League under Rafa Benitez in 2008-09, Xabi Alonso signed for Madrid before Javier Mascherano moved to Barcelona the following summer. Liverpool and their midfield have never been the same since. The likes of Alberto Aquilani and Christian Poulsen have failed in their attempts to replace the pair while last season’s summer acquisitions, Charlie Adam and Jordan Henderson, are still to convince the Anfield faithful. In the early stages of his career at the club, it would seem Rodgers favours the attacking 4-3-3 formation that earned him so many plaudits at Swansea with two holding midfielders behind a more advanced figure. The formation is a perfect fit for Sahin, a system where he could sit deep alongside the highly-rated Lucas Leiva and ping balls forward for the likes of Steven Gerrard and Luis Suarez, while also spreading it wide for Stuart Downing and Fabio Borini. It’s worth adding that Sahin is not the same player as Xabi Alonso but with his passing ability, excellent awareness of space along with his eye for a killer ball, he could and should provide something Liverpool have been crying out for since 2009 – a little bit of class in the centre of the park. After their sluggish start to the new Premier League campaign, Sahin’s imminent arrival is a welcome one and with the promising Joe Allen amongst the other summer arrivals, competition for places may just get the best out of Adam and Henderson. Sahin may not have been given the chance to become Xabi Alonso’s successor at Madrid but for Liverpool, three years too late some may argue, he may just be given that chance. Sergio Ramos was left to rue Barcelona’s opening goal in Real Madrid’s 3-2 defeat to Barcelona in the first leg of the Supercopa, but insisted all is still to play for in the tie ahead of the return fixture. The Blancos go into next week’s match at the Santiago Bernabeu on the back of a slight deficit to their Clasico rivals, but Angel Di Maria’s late goal, aided by a mistake from Victor Valdes, leaves the trophy up for grabs. Pepe, who was forced off in the first leg, is expected to miss the game against Getafe at the weekend with Raul Albiol expected to deputise. “No-one doubts the importance of Pepe to the team, but we have great depth and Albiol is a great asset who can perform perfectly as a starter,” noted the Spain stopper. Madrid face their city rivals on Sunday before resuming Supercopa duties three days later on August 29. Angel Di Maria has insisted that Real Madrid will do “everything” possible to win the second leg of their Supercopa clash against Barcelona next week, after falling to a 3-2 reverse at Camp Nou. The result leaves the Catalan giants taking a slender one-goal advantage into the return leg, but with the scoreline finely poised, the winger, who scored a crucial second for his side, is backing his side to overturn their deficit at the Santiago Bernabeu. “The result is not good for us, but we are calm. Playing at home, with our fans behind us, we will do everything possible to win the match and the trophy,” Di Maria told the club’s official website. “We knew what we were facing, Barcelona always play the same way and we wanted to play the game that we have played in recent visits to Camp Nou. Jose Mourinho’s men welcome Barca to the capital for the return leg next Wednesday evening, with both teams returning to Liga action at the weekend.